No matter who we are, we share a common need for sleep. Though this need has been a constant throughout human history, our relationship to sleep, and our understanding of its vital benefits, has gone through dramatic ups and downs. And right now that relationship is in crisis. At the same time, we're living in a golden age of sleep science -- revealing all the ways in which sleep and dreams play a vital role in our decision making, emotional intelligence, cognitive function, and creativity. I wroteto examine this ancient, essential, and mysterious phenomenon from all angles, and to explore the ways we can use sleep to help regain control over our out-of-kilter lives. The goal of the book is to move us from awareness to action. So I hope you'll be inspired to renew your relationship with sleep -- in all its mystery and all its fullness -- and join the sleep revolution, transforming your life and our world one night at a time. Sleep is one of humanity's great unifiers. It binds us to one another, to our ancestors, to our past, and to the future. No matter who we are, we share a common need for sleep. Though this need has been a constant throughout human history, our relationship to sleep, and our understanding of its vital benefits, has gone through dramatic ups and downs. And right now that relationship is in crisis. The evidence is all around us. If you type the words "why am I" into Google, the first autocomplete suggestion -- based on the most common searches -- is: "why am I so tired?" The existential cry of the modern age. And that's not just true in New York but in Toronto, Paris, Seoul, Madrid, New Delhi, Berlin, Cape Town, and London. Sleep deprivation is the new lingua franca. Though we may not be getting much of it ourselves, we certainly talk (and post and tweet) about sleep a lot. There are nearly five thousand apps that come up when you search "sleep" in the Apple App Store, more than 15 million photos under #sleep on Instagram, another 14 million under #sleepy, and more than 24 million under #tired. A quick search for "sleep" on Google will bring up more than 800 million results. Sleep is on our minds, and in the news, as never before. But even though we now know more about the science of sleep than ever before, and how important it is to every aspect of our physical, mental, emotional, and spiritual well-being, actually getting enough sleep seems harder and harder. Advances in technology have allowed us to pull back the curtain on what's going on while we sleep, but technology is also one of the main reasons our relationship to this fundamental part of our existence has become so compromised. Of course it's not just technology that comes between us and a good night's sleep. It's also our collective delusion that overwork and burnout are the price we must pay in order to succeed. Feeling that there aren't enough hours in the day, we look for something to cut. And sleep is an easy target. In fact, up against this unforgiving definition of success, sleep doesn't stand a chance. As I went around the country talking about Thrive, my book about redefining success, I found that the subject that came up the most -- by far -- was sleep. Everywhere I went someone would pull me aside and, often in hushed tones, confess, "I'm just not getting enough sleep. I'm exhausted all the time." Or, as one young woman told me after a talk in San Francisco, "I don't remember the last time I wasn't tired." By the end of an evening, I'll have had that same conversation with any number of people in the room. And what everyone wants to know is, "What should I do to get more sleep?" It's clear that if we're going to truly thrive, we must begin with sleep. It's the gateway through which a life of well-being must travel. From the moment we're born until the moment we die, we're in an inextricable relationship with sleep. It's the dominant subject for the parents of a newborn. And at the other end of our lives, the phrase that describes the best way for someone to go is "peacefully in his sleep." So we all have an intimate -- and unique -- relationship with sleep. Even when we fight against it, it's like an intense, on-again, off-again relationship with an ex who's never moved out. Sometimes it's healthy and supportive of everything we do while we're awake, and sometimes it's wildly dysfunctional and destructive. To paraphrase Tolstoy -- who himself was fascinated with sleep -- every unhappy relationship with sleep is unhappy in its own way. But whether we embrace it or resist it, one way or the other, we're all dealing with sleep every day, every night, all the time. What I've learned is that in today's world, the path of least resistance is the path of sleep. And unless we take specific and deliberate steps to make it a priority in our lives, we won't get the sleep we need. Because today a full night's rest has never been more difficult to come by. With the demands of work and family and our ubiquitous and ever-growing arsenal of glowing screens and devices, we're hyperconnected with everyone in the world -- often from the second we wake up to the second we finally fall asleep. But unless we're vigilant, we can become disconnected from ourselves. And yet, at the same time, we're living in a golden age of sleep science -- revealing all the ways in which sleep and dreams play a vital role in our decision making, emotional intelligence, cognitive function, and creativity. And how lack of sleep is often the culprit behind anxiety, stress, depression, and a myriad of health problems. It's only relatively recently that we've come to fully grasp the medical consequences of sleep deprivation. In the 1970s, there were only three centers in the United States devoted to sleep disorders. By the 1990s, that number had swelled to more than 300. Today there are more than 2,500 accredited sleep centers. Even so, the delusion persists that we can do our jobs just as well on four or five or six hours of sleep as we can on seven or eight. It's a delusion that affects not only our personal health but our productivity and decision making. In other words, we may not have as many good ideas as we would have otherwise had, we may not be as able to come up with creative solutions to problems we're trying to address, or we may be short-tempered or waste a day (or day after day, or year after year) going through the motions. And in some occupations -- in our hospitals, on our highways, or in the air -- lack of sleep can be a life-or-death matter. But even as we advance the science of sleep, we're also in desperate need of rediscovering its mystery. Every night can be a reminder that we are more than the sum of our successes and failures, that beyond all our struggling and our rushing there is a stillness that's available to us, that comes from a place deeper and more ancient than the unending noise that surrounds us. When we connect to that stillness through sleep, we can tap into it, even in the middle of the most action-packed day. "Learning to let go should be learned before learning to get," said Ray Bradbury. And surrendering to sleep every night is the ultimate letting-go. 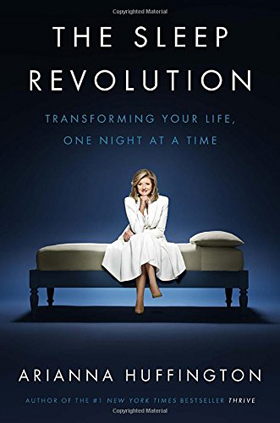 I wrote The Sleep Revolution to examine this ancient, essential, and mysterious phenomenon from all angles, and to explore the ways we can use sleep to help regain control over our out-of-kilter lives. The goal of the book is to move us from awareness to action. What we need to be aware of first is that we are indeed in a sleep crisis. More than 40 percent of Americans get less than the recommended minimum seven hours of sleep per night, with similar (or worse) statistics from around the world. It's a phase that actually started with the Industrial Revolution, in which sleep became just another obstacle to work. The veneration of sleep as a unique portal to the sacred was sacrificed to the idea of progress and productivity. The twentieth century saw the labor movement pushing back against the encroachment of work into our personal lives. However, the end of the century also saw technological advances that allow our workdays to essentially never end, which is where we are today. At the same time, with the birth of the new science of sleep, we began to discover that sleep is in fact deeply connected to every aspect of our physical and mental health. We're finding out what, exactly, is going on when we finally drift off. The short answer: a lot. Far from being a time of inactivity, sleep keeps many parts of the brain feverishly busy, and what they're doing -- or not doing, if we neglect sleep -- has huge consequences. We now know that sleep deprivation is linked with increased risks of diabetes, heart attack, stroke, cancer, obesity, and Alzheimer's disease. And this new golden age of sleep science is fueling a sleep revolution. People want more sleep, and the market is responding. Hotel rooms are being transformed into sleep temples, schools are modifying start times to suit the sleep needs of teenagers, an exploding market in wearable technology has emerged that tracks our sleep, and a range of smart products -- from smart mattresses to smart headphones -- has entered our lives. And yet there is a lot more to do. Solving our sleep crisis requires not just practical changes to how we approach our days and our nights but also rethinking our priorities and what we really value. Sleep is, after all, at the center of our overall vitality. When we sleep well, we feel better, and vice versa. We may be what we eat, but also, to be sure, we are how we sleep. We need to reclaim this special realm -- not just because sleep makes us better at our jobs (though there's that) and not just because it makes us healthier in every way (there is that, too), but also because of the unique way it allows us to connect with a deeper part of ourselves. Because when we are asleep, the things that define our identity when we're awake -- our jobs, our relationships, our hopes, our fears -- recede. And that makes possible one of the least discussed benefits (or miracles, really) of sleep: the way it allows us, once we return from our night's journey, to see the world anew, with fresh eyes and a reinvigorated spirit, to step out of time and come back to our lives restored. These two threads that run through our life -- one pulling us into the world to achieve and make things happen, the other pulling us back from the world to nourish and replenish ourselves -- can seem at odds, but in fact they reinforce each other. So I hope you'll be inspired to renew your relationship with sleep -- in all its mystery and all its fullness -- and join the sleep revolution, transforming your life and our world one night at a time. For Arianna's sleep tips and more visit AriannaHuffington.com. The Sleep Revolution will be available everywhere books are sold on April 5, 2016.